The Patchery custom-made clothing for kids: you design it, they sew it! "Sewing is for some. Creativity is for all." That's the premise behind new, kid's custom-made clothing company The Patchery. The company's process is simple: mix and match from among their many different clothing patterns and fabric selections to order a bespoke item for your little one. You get to choose the fabric for each part of the item too. If you want hot pink sleeves with contrast floral trim, it's done! Want a two-tone color block t-shirt with a graphic print patch pocket? Easy! The Minnesota-based company cuts and sews all items locally. 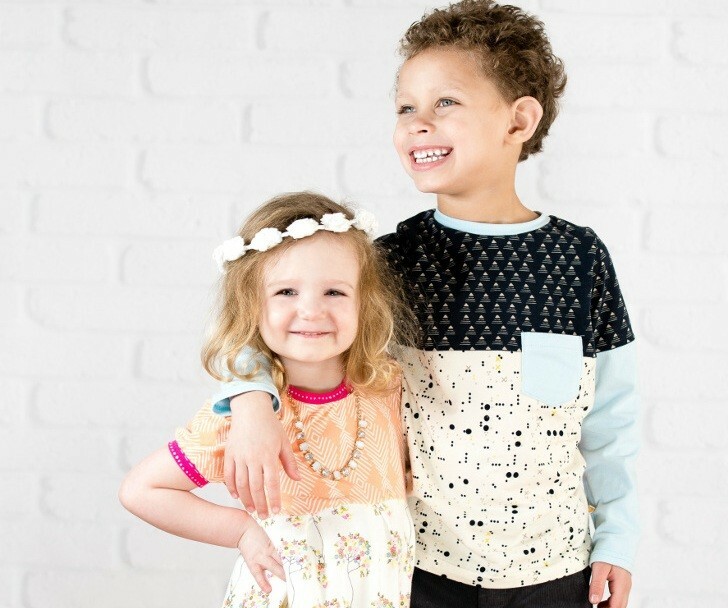 If you're looking for beautifully handcrafted children's clothing with a bit of personalized flair, read on for more details. The Patchery is the brainchild of Amber Gunn Thomas, and she founded the company with her husband, Ryan Thomas. As they explain: “The story starts, as all good stories do, with a moment of inspiration. Amber was sewing clothes for her kids, immersed in the creative process, when she thought, ‘Why can’t this be available to everyone, even if you can’t sew?’ And that was the beginning of The Patchery.” Alright, maybe it was a little more complicated than that: Amber also explains that she had left her corporate marketing job to start consulting in 2013 and was enjoying some new-found free time to sew clothes for her two children. That’s when the idea for The Patchery hit her and after 10 months of research and planning, the company opened for business in January 2015. RELATED | Wool and the Gang Offers a Range of Handknits for Little Ones – That You Can Buy or DIY! So, how does it work? Hop online to The Patchery website and hit the Create button. There you’ll find six basic designs and 46 fabrics to choose from. Each piece of clothing has multiple panels, so you can pick and choose your fabrics to complement or contrast each other as much as you like. Once you’ve chosen your prints and colors, you can review your selection and choose a size. Items are available in sizes 2T to 6. Then The Patchery’s Minnesota-based team of cutters, sewers, inspectors and pressers will get to work crafting your item. Dispatch is in around three to four weeks from ordering. All items are made to be easy on/off, with no buttons or zippers, and every piece is easy care and machine washable. T-shirts start at $26 and dresses are $46 to $52. Free standard shipping comes with all orders. For more details, head on over to The Patchery website and get creating! So, how does it work? Hop online to The Patchery website and hit the Create button. There you’ll find six basic designs and 46 fabrics to choose from. Each piece of clothing has multiple panels, so you can pick and choose your fabrics to complement or contrast each other as much as you like. Once you’ve chosen your prints and colors, you can review your selection and choose a size. Items are available for sizes 2T to 6. The Patchery’s Minnesota-based team of cutters, sewers, inspectors and pressers will get to work crafting your item. Dispatch is in around three to four weeks after ordering. All items are made to be easy on/off, with no buttons or zippers, and every piece is easy care and machine washable. T-shirts start at $26 and dresses are $46 to $52. Free standard shipping comes with all orders.